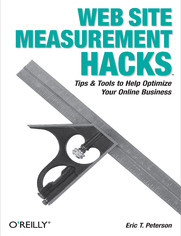 Why Web Site Measurement Hacks? 1.1.1. Why Measure Your Site? 1.1.4. Why Not "Web Analytics?" 1.5.3.1. Put the word out that youre looking for some serious talent. 1.5.3.2. Be prepared to hire someone senior enough to be truly effective. 1.5.3.3. Provide additional financial incentive based on successful attainment of goals. 1.8.3. Once You've Determined Intent, Then What? 1.12.1. Analog: Where to Get It! 1.14.1.1. Tracking code to be placed into the feed or article you want to track. 1.14.1.2. Tracking code to be referenced externally (the track_rss.js file). 2.3.2.3. When a first-party cookie is a third-party cookie. 2.3.3.1. Use true first-party cookies whenever possible. 2.3.3.2. Use DNS to make it look like you're using first-party cookies. 2.3.3.3. Make sure your privacy and P3P policies accurately reflect what you're doing. 2.4.3. How Can I Tell If I'm Using a First- or Third-Party Cookie? 2.5.1.1. Using the IP address. 2.5.1.2. Using IP address and user agent strings. 2.5.1.3. Using the authenticated username (when available). 2.5.1.4. Using a session identifier (when available). 2.7.3. Why Not Just Collect Everything? 2.7.3.1. It takes time to reprocess data. 2.7.3.2. There are costs associated with collection and storage. 2.9.1.1. A page tag did not get placed in the page. 2.9.1.2. The page tag doesn't work as intended. 2.9.1.3. Page tagging is your only data collection method. 2.9.1.5. The request was blocked by security software. 2.9.1.6. The information is never received by the data collector. 2.9.2.1. The browser serves the request from the local cache. 2.9.2.2. The content is served from a content distribution network (CDN). 2.9.3. Knowing All This, What Should You Do? 2.11.1.1. Identify known robots and spiders. 2.11.1.2. Be on the lookout for new robots and spiders. 2.11.1.3. Build and deploy a robots.txt file. 2.11.2. Remember That Some Spiders Are Good! 2.12.3.1. Deploy an "images never expire" policy. 2.12.3.2. Use caching defaults for occasionally changing content. 2.12.3.3. Consider a content distribution network (CDN) for images and code. 2.13.1.1. Properly identifying dynamically generated pages. 2.13.1.2. Identifying marketing campaign response. 2.13.1.3. Collecting HTML form data for analysis. 2.14.2.1. Know where you're collecting personably identifiable information. 2.14.2.2. Explain clearly and truthfully what you're going to do with the data. 2.14.2.3. Consider third-party privacy certification. 2.14.2.4. Beware of the spookiness factor. 2.16.1. Sounds Great, How Do I Set One Up? 2.16.1.2. Step two: Determine which policies apply to which pages. 2.16.1.3. Step three: Select a P3P policy generator. 2.16.1.4. Step four: Enter the information. 2.16.1.5. Step five: Create a policy reference file. 2.16.1.6. Step six: Validate your policy. 2.16.2. Wait, How Do I Deliver the Compact Policy? 2.16.3.2. Visitors will wonder why you don't care about their privacy. 2.16.3.3. Eventually, the press will wonder why you don't care. 2.17.2.3. Step three:The page tag collects data and reports back. 2.18.1. Really, What Is a "Web Bug"
2.18.3.2. Ensure that your P3P policy reflects your use of page tags. 2.18.3.3. Have a good explanation ready if people complain. 2.21.1.1. Integrate cost data to calculate gross margin contribution. 2.21.1.2. Integrate marketing cost data to determine real campaign ROI. 2.21.1.3. Integrate customer registration data to drill into demographics. 2.21.1.4. Integrate customer satisfaction data. 2.21.1.5. Integrate data from targeted email campaigns. 2.21.2.1. Identify the problem you'd like to solve. 2.21.2.2. Identify the sources of web and non-web data that will be required. 2.21.2.3. Determine how you're going to tie the data sources together. 2.21.2.5. Generate reports and take action. 2.23.1.1. Web site is slow or fails to respond. 2.23.1.3. Aborted page views and downloads. 2.23.2.1. Using logfiles as a data source. 2.23.2.2. Using page tags as a data source. 2.23.3.1. Investigate errors in relation to traffic loads. 2.23.3.2. Investigate errors in relation to web browsers. 2.23.3.3. Investigate errors in relation to your servers. 2.23.3.4. Investigate errors in relation to dynamic URLs. 2.25.1.6. Bringing the packages together with rss_report.pl. 3.2.2.3. Revenue per visit or visitor. 3.2.2.4. Order and buyer conversion rates. 3.2.2.5. Return on investment (ROI). 3.2.3.2. Lifetime value of a campaign. 3.4.1.2. Don't limit your definition to a single session. 3.4.1.3. If you're not sure how to set conversion events, consult your vendor. 3.4.1.4. Make an attempt to assign a dollar value to non-revenue conversion events. 3.5.4.3. Cost per acquisition (CPA). 3.6.2.1. Response rate and basic response metrics. 3.6.2.4. Conversion events and rates. 3.6.3.3. Date and time of delivery. 3.6.3.6. The call to action. 3.6.4. How to Put This Data to Work! 3.7.1.1. Low data gathering strategy. 3.7.1.2. Medium data gathering strategy. 3.7.1.3. Large data gathering strategy. 3.7.2.1. Response rate (click-through rate). 3.7.2.3. Conversion rate by search engine and keyword. 3.7.2.4. Revenue (or loss) by search engine and keyword. 3.7.2.5. Lifetime value of visitors from paid search marketing. 3.7.3. What Do You Do with the Data? 3.7.3.1. Low data gathering strategy. 3.7.3.2. Medium data gathering strategy. 3.7.3.3. Large data gathering strategy. 3.8.5. Now That I Can Tell Them Apart, What Do I Do? 3.8.5.2. Conversion rate by engine and keyword. 3.8.5.3. Revenue (or loss) by search engine and keyword. 3.8.5.4. Lifetime value of visitors from organic search. 3.9.4. How Can I Capture the Necessary Information and Create This Report? 3.10.1. Pay for Clicks, Leads, or Revenue: Which Is Better? 3.10.2.1. Paying for clicks? Determine your per-affiliate click-through rate. 3.10.2.2. Paying for leads? Measure lead generation rates. 3.10.2.3. Paying for performance? Paying commissions based on sales. 3.10.2.4. Other useful metrics used to measure affiliate marketing. 3.12.2.1. Simple RSS tracking using web server logfiles. 3.14.1.1. Understand the capabilities of your web measurement application. 3.14.1.2. Clearly identify your value events. 3.14.1.3. Clearly delineate multiple value events. 3.14.1.4. Decide what information is to be captured at each value event. 3.14.2.1. Calculation of conversion to one value event. 3.14.2.2. Calculation of conversion to one or more value events. 3.14.2.3. Calculation of conversion through more than one value event. 3.16.2. The System Is Working, So Where Did the Clicks Go? 3.16.2.1. Is your landing page a bandwidth hog? 3.16.2.2. Is your tracking code in the optimal location (for tag-based solutions)? 3.16.2.3. Is your tracking code still deployed properly (tag-based solutions)? 3.16.2.4. Are you tracking page views, visits, or visitors? 3.17.2.1. By media source of the visitor. 3.17.2.2. By the "offer" you make to the visitor. 3.17.2.3. By the advertising copy you use. 3.17.2.5. By category or item of purchase. 4.4.3.1. What Matters to People Matters to Search Engines. 4.5.1.1. Time spent per page. 4.5.1.2. Time spent on site. 4.5.2.1. Delays due to download and rendering time. 4.5.2.2. Variability in treatment of the final page in a visit. 4.5.2.3. The randomness of human behavior. 4.5.4.1. Think about your pages in context. 4.5.4.2. Compare page times to ideal ranges. 4.5.4.3. Identify why problems occur. 4.6.1.2. Missing page tracking tags. 4.6.1.3. Expiration of visit session. 4.6.4.2. Ratio of page entries to exits. 4.8.1.1. Step one: Adding a product to the shopping cart. 4.8.1.2. Step two: Logging in. 4.8.1.3. Step three: Billing and shipping. 4.8.1.4. Step four: Payment and confirmation. Hack #61. Measure "Internal Campaigns"
4.12.1.1. Percentage of visits using search. 4.12.1.2. Searches per search visit. 4.12.1.3. Percentage of exits from the search return page. 4.12.1.4. Conversion of search visits to sales, leads, or other desired conversion. 4.12.1.5. Average items per order for search visits versus non-search visits. 4.12.1.6. Percentage of searches with no results ("zero results" searches). 4.12.1.7. Percentage of searches that generate no clicked links ("zero yield" searches). 4.12.1.9. How to track "zero results" searches. 4.13.2.1. Point your search index to the "right" information. 4.13.2.4. Make sure new pages are indexed correctly. 5.1.1. Why the "Quotes" on Demographics? 5.2.2.1. Basic aggregate performance and availability integration. 5.2.2.2. Detailed performance and availability integration. 5.2.2.3. Geographically correlated performance and availability integration. 5.4.2. So When Do We Switch Over? 5.11.1.1. Pass demographic data to a server log analyzer. 5.11.1.2. Pass demographic data to a client-side page tag. 5.11.3.1. It is usually not easy to do. 5.11.3.2. It requires tremendous planning to pull off properly. 5.11.3.3. Most often your sample size will not be significant. 5.11.3.4. Some consumers are liars when filling out forms. 5.11.3.5. Not every report is always available for every segment. 5.11.3.6. Occasionally the payback is hardly worth the effort. 5.12.2. How Do They Do That? 5.13.1.1. Mine basic HTTP requests. 5.13.1.2. Mine basic HTTP requests for download completion. 5.13.1.3. Compensate for download managers. 6.3.5. When Is a Shopping Cart Not a Shopping Cart? 6.3.5.1. The cart as a shopping list. 6.8.1.1. Step one: Track cross-sell links separately. 6.8.1.2. Step two: Measure cross-sell performance. 6.8.1.3. Step three: Take action. 7.5.1.1. Use KPIs to drive action. 7.5.1.2. Present KPIs visually whenever possible. 7.5.2. Use the language of the business to increase familiarity. 7.5.2.1. Explain the how and why of KPIs. 7.7.1.2. Average order value (AOV). 7.7.1.3. Percent new and returning visitors. 7.7.1.4. Ratio of new to returning visitors. 7.7.2.3. Cart add to purchase conversion rate. 7.7.2.5. Search to purchase conversion rate. 7.7.2.6. New and returning visitor conversion rates. 7.7.2.7. Percent of visits less than 90 seconds. 7.8.1.1. Average pages viewed per visit. 7.8.1.2. Average visits per visitor. 7.8.1.3. Percent new and returning visitors. 7.8.1.4. Ratio of new to returning visitors. 7.8.1.5. Average time spent on site. 7.8.2.1. Percent of visits less than 90 seconds. 7.8.2.3. "Stickiness" for key pages. 7.9.1.1. Average pages viewed per visit. 7.9.1.2. Percent new and returning visitors. 7.9.1.3. Average time spent on site. 7.9.2.1. Percent "zero results" searches. 7.9.2.3. Percent "zero yield" search results. 7.9.2.4. Percent of visits less than 90 seconds. 7.9.2.5. "Stickiness" for key pages. 7.9.2.6. "Information find" conversion rate. 7.10.1.1. Lead generation conversion rate. 7.10.1.2. Average visits per visitor. 7.10.1.3. Percent new and returning visitors. 7.10.1.4. Ratio of new to returning visitors. 7.10.1.5. Average time spent on site. 7.10.2.1. Average hours to response (online inquiry). 7.10.2.2. Percent of visits less than 90 seconds. 7.10.2.5. "Stickiness" for key pages. 7.11.2.1. Add simple visitor segmentation. 7.11.2.2. Clean up duplicate page names. 7.11.2.7. Track exits from the site. 7.11.2.8. Add multi-session tracking functionality. 7.11.2.9. You could get the logfile from a remote location via FTP.